In January, the chairman of OCMV in Antwerp, Liesbeth Homans went to Utrecht to become acquainted with Barka. That Polish welfare organization tries to convince Polish people, who abroad fell into problems and live in poverty, to go back to their own country and start putting their lives back together there. Due to rising number of problems with Polish homeless in Antwerp – according to the reports there were more than 300 problematic cases by now – Homans counts on the rescue in the method of Barka. She calls it: „humane way of motivating people to go back”. The organisation has already succeeded in several European countries. „Since 2012 we were able to motivate about 700 people to leave the Netherlands and go back to their home land”, says Barka coordinator Magdalena Chwarścianek. Meanwhile, the first two Polish streetworkers has been busy for 2 weeks in Antwerp. The project is financed by the city. 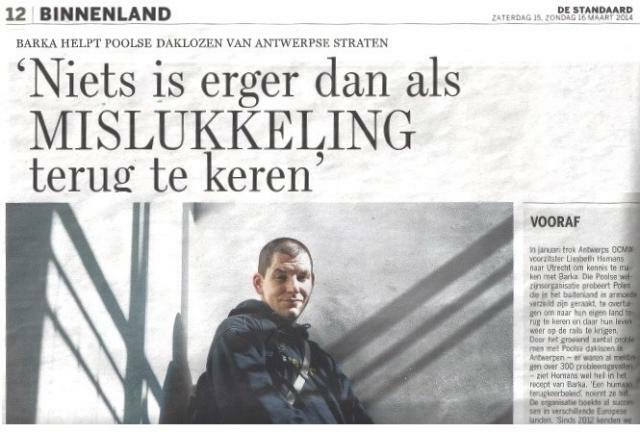 Problems with alcohol, illegitimate work, poverty… it’s really difficult in Antwerp for Polish homeless. Even so, they don’t want go back to their country. „The guys deny that to keep themselves strong”, say social workers. The Polish organization Barka wants to motivate them to grow to their own decision of going back. „I don’t need any help”, says Filip (28) firmly. „I will manage myself. Always did”. We are meeting the Polish man in the restaurant for the homeless – Kamiano, a part of Antwerp Saint Egidius community. Filip has been living in our country for 3 years. During this period everything went exactly opposite way than he has imagined. „The first 3 months here were the hardest”, he says. Back then Filip often slept on the street. His tired face shows off that hard period. Except working illegitimately , every now and then, he couldn’t find anything decent. And his problem with alcohol didn’t make it easier . Filip works 2 days a week as a cleaning person in the restaurants and the disco. „And I drink much less than before”, he adds quickly. But he is still far from the life he would like to have. Asked, if he wouldn’t prefer to build his future in Poland, after all the disappointments he experienced here, he answers firmly: „No”. „There is nothing for me in Poland anymore.” And it’s out of question for him to ask for help to go back. „If we wanted to go back, we would go on our own”, points out his country fellow Jaru (40). Even so, the Polish welfare organization Barka tries to convince Polish and also other Eastern European people, who suffer poverty and homelessness here, to change their attitude. However, the coordinator, Magdalena Chwarscianek doesn’t agree to be called and treated as sort of „deportation police”. „Our main goal is to help people to get out of the street”, she says. „We want to help them with their alcohol addiction and offer them new perspectives. From our experience we know, that it is easier to address such issues if we deal with them in our home country”. Witold cheers up when we start talking about his home town, Katowice, in the southern part of the country. „My brother is getting married this summer.” But for himself, Witold doesn’t see any future there. The young man is still hoping to find a new job in Belgium or in the Netherlands. „The summer season is coming, so there will be more possibilities to work outside”, he says. Mariusz is experienced himself, he knows what he is talking about. Few years ago he fell into the critical situation when he was in Dublin, Ireland. His alcohol addiction pushed him into the spiral of problems. Only after 3 years living on the street, somebody from local Barka-team helped him out of the street. In Barka community in his homeland he was finally able to address his addiction. „And now I work as the ‘experienced one’ ”, he grins. „Polish people who have been living here for years, often don’t have a realistic idea anymore, how is the situation back home”, tells Mariusz. „They try to convince themselves, that the most possibilities they could have, they have here. They are doing this to keep themselves morally strong. Even if the reality looks completely different”. However he admits that back then in Dublin, he wasn’t easy to be convinced either. „Nothing is worse than to come back home as a loser. Especially while your family expects that you found a good job and will be sending money”. Filip knows the intentions of Barka, but he still is not convinced. „The salary I could get in Poland, would be still 4 times lower than here”, he points out. „So it’s just not worth it.” „Barka should better help us here, with looking for a job or house”, says Jaru, who admits that he doesn’t trust the organisation yet. „We are busy only for 2weeks now”, closes Mariusz. „At the moment we don’t even speak about going back. We have to earn their trust first.” Mariusz is already planning to go back to Poland, when he finishes his assignment in Antwerp. He got back in touch with his family again, when he knocked on his father’s door at Christmas Eve in 2012, after 8 years of absence. This bond he doesn’t want to lose again.